Lately I found myself working on an ARM64 (aka aarch64) based system which in turn I don’t own. So I needed to get a system to build and test things on. One possibly wants to use Xephyr to test some stuff, probably on the safer side. Similarly, you’ll get to use gdb or any tooling you need and is available for the architecture. You get to code against your project against the platform you need by passing the extra required arguments, then most features discussed here apply. Granted it will work rather slow, as it’s emulation, but given the alternative is not being able to work at all, I’m happy. Note that most of this applies for any architecture, replacing aarch64 for any architecture supported by qemu (and your distro of choice): You can check /usr/bin/qemu-*-static. One of the things I’ve heard on every KDevelop sprint is: we should be light, like Kate but with our added value. We’ve addressed this in many ways so far: we’ve optimized the code for performance so it’s more responsive and starts reasonably fast, we’ve made sure most done is accessible using the keyboard so we don’t feel clumsy and overwhelmed by all the options. What do we miss to be that ideal light editor? What’s a good lightness inspiration? Otherwise, TLDR, there’s a video below. The avid Planet KDE reader will know that being light is a complex concept, there’s many ways to perceive lightness: Is Kate light? Is KWrite light? When we talk about lightness, we generally refer to different metrics. If something is worth waiting for, we wait, and that’s fine. We don’t want to feel we’re wasting our time. A good example there I’d say it’s Chromium. It’s probably one of the heaviest beasts we run on our systems. Nevertheless, it doesn’t feel as such (at least until you run out of memory). There’s another point of view: We bomb users with features. In fact, it’s awesome to have features and it shouldn’t be a trade-off. On the other hand we’re never using all features at the same time, optimizing that would be awesome. We should work on it: identifying the different workflows and creating user interfaces that enable them. One of the developments that have struck me the most during last years is Kate. Instead of focusing on the editor, it went the KDevelop route: it has started to offer all of the information at once (especially odd, given that there’s quite some feature overlapping). On one hand, there’s atom.io and sublime that seem to be doing something very similar. Most of the components they have we have as well, but then the focus is rather different: they have very few visual interaction components, mostly just the menu, so you can just play with the text and you know where to go look for stuff. UI’s are usually embedded in the source code view. On the other hand, there’s Eclipse or Visual Studio that do something quite similar to what we do: present everything in the traditional desktop application way with docks and a couple of smart tricks, because they try to tackle the whole workflow problem. I understand how we got to where we are, but I also really understand why people can prefer something like atom. My feeling is that “It doesn’t make me feel like I should be debugging while I’m coding”, even though they oversimplify on some areas. I decided that I wanted to feel what’s to work without all the clutter, so I implemented a Concentration Mode for KDevelop. I stripped most of the visual stress, so usually we’re left with the good ol’ katepart editor, with all KDevelop‘s features. I’ll become my own guinea pig: now that I have it clean, how do I use the tools? Can I still do the same things? As discussed on the mailing list, this has had some fruits already. I think it’s really cool: code, code, code, quick open and shortcuts. Now, a bit of a video implementing what I discussed here. 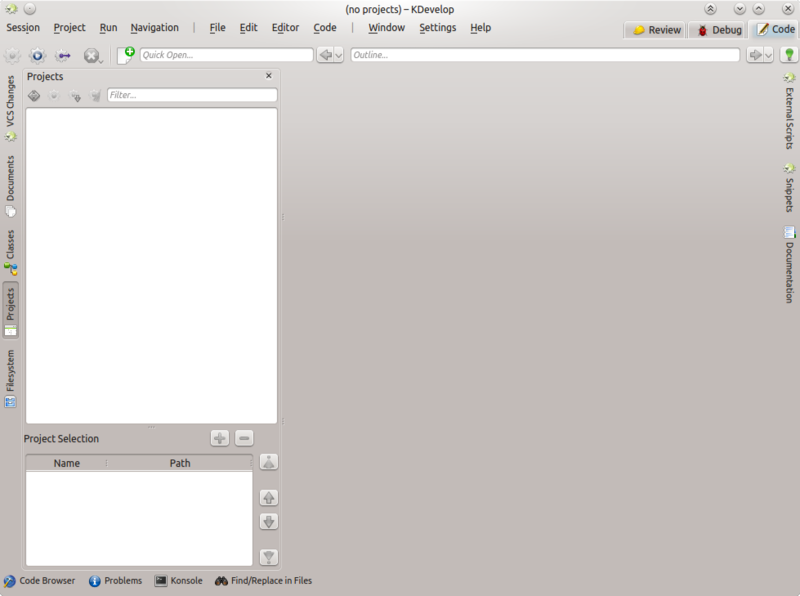 We get to hide the navigation handle, leaving only the toolbar, the document title and the central view. The toolviews are still accessible. For now, I can decide to just see what I’m working on. Now. 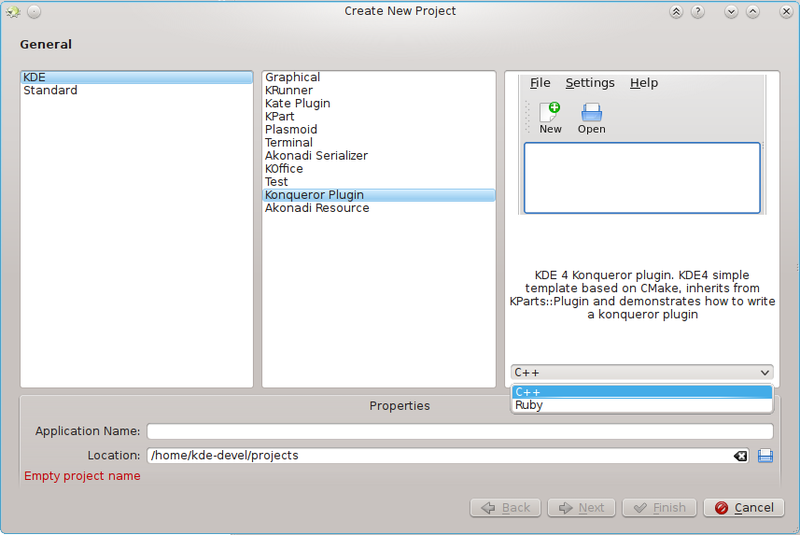 As we announced recently, we’ve kept working on the stable version of KDevelop to bring you the polished software you’re looking for. Many bugs have been fixed during the last weeks, I think we can safely say that it has improved since the last beta and of course, KDevelop 4.3. If you want to try it now that it’s still hot, you will be able to find the tarballs for you to compile here. I guess you see what I mean. To solve this problem we discussed many times about creating some way to Kickstart a KDevelop session properly, this is what I came up with. It’s nothing very different from what others do, but it’s ours, so that makes it immensely awesome. I guess you’ll understand about it easy by putting a video, looking forward to your feedback! Today I would like to talk a little about some work I’ve been doing recently in KDevelop in order to assure we have a good path for the new KDevelop user and KDE or free software Developer. I think that KDevelop has been quite good at being adopted by people who know their way in the development process: in few words, people who already know the language they’re using and usually they can fill any lacking feature KDevelop might have, by doing some old-style terminal hacking :). No problem with that, but apparently not everyone is born with some wizard skills, so I’d like to improve this situation. There are many aspects that can be improved and some have been lately. 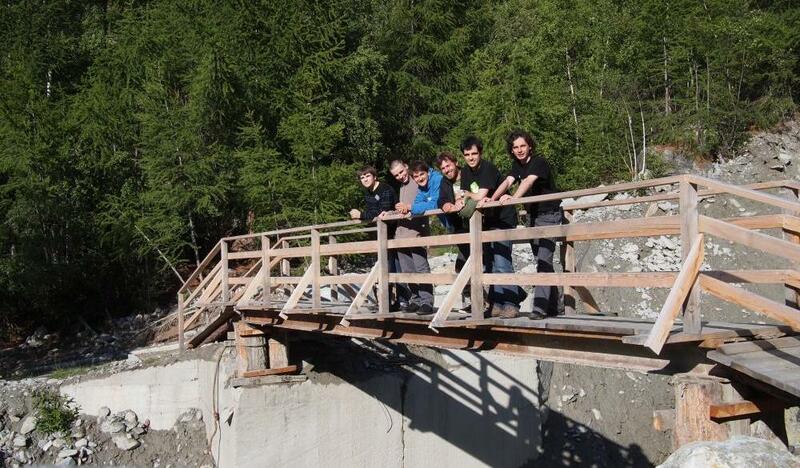 One of the most annoying things that we found (mostly in Randa, in the KDevelop team and some random spontaneous meeting) to be more annoying, was our “New Project” wizard, specially when it comes to start new technology based in KDE. There are some things I don’t like here: The tree view looks clumsy and doesn’t lead the user anywhere, so whenever I have considered to create a new project from this dialog, I’ve felt violated somehow. 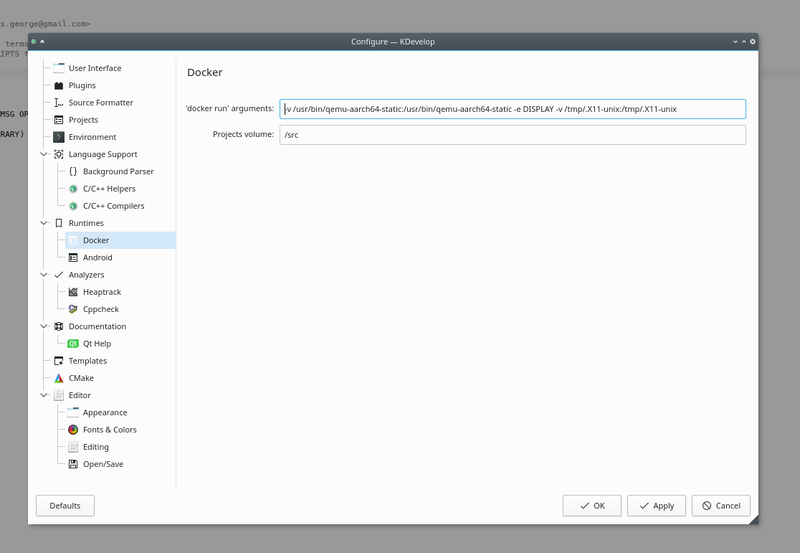 What I’m going to show here has to be taken as a first step towards where I want future KDE Developers experience to start (if they are starting a new project). 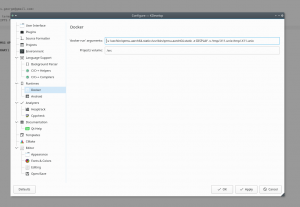 The idea here is that the user will select, first of all, what kind of application is going to be created, roughly: KDE Application, just a standard application, a web service or whatever it’s needed. 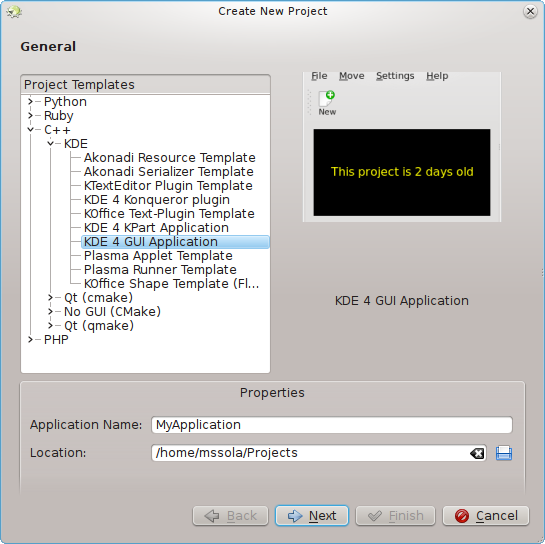 Using KDE as an example, we’ll select if we want to create a console application, GUI application, Plasmoid, etc. Finally, we’ll select the language we want to use be C++, Python or whatever it’s available. That last step change is important, because we’re adding more importance at what we are doing (a Plasmoid for example) than if we are going to do it in C++ or Python. Add some category information, categories are not translatable right now and they can’t have an icon. I’d like to see this improved. KNewStuff support to download new templates? 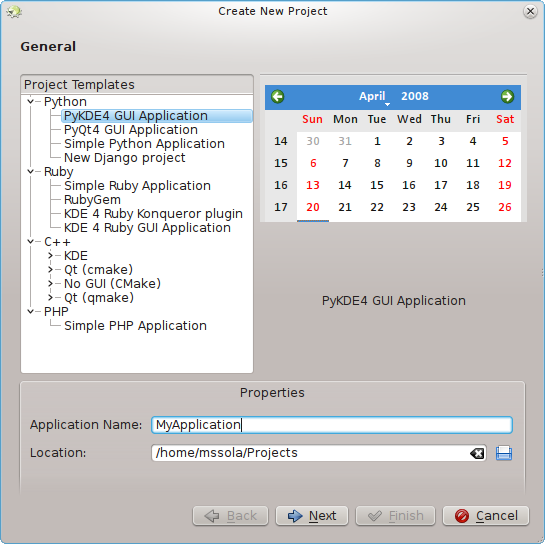 Make sure the KDE GUI application templates are equivalent for C++ or Python. Improve the template’s description. Add links to techbase! Think about the templates you always wanted as a kid and contribute them! Oh! And last but not least, Big thanks to Àlex Fiestas for helping me sorting the templates and discussing the ideas, and Aurélien Gâteau for giving me a hand at making the GUI more usable. After all this lonely KDE hacking, it feels great to sit down with someone else and try to take the best out of you on what you’re doing!